Another nightmare, in the woods this time. Different: She was running. Trying to escape. Emma Rayburn was born and raised in Baron Hollow, North Carolina, and it was a quiet life. Then came the accident…and the nightmares—each filled with unshakable visions of darkness, blind panic, and desperate women chased toward inevitable death. With no reports of local women missing or found dead, Emma has written it off to troubled imaginings—night after dreaded night. Until her sister arrives. 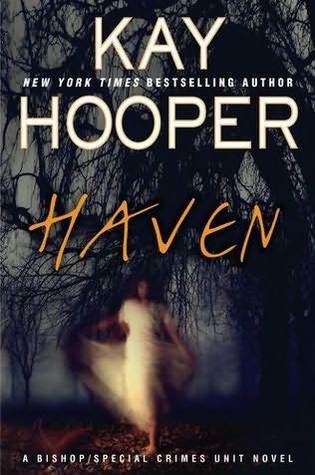 Jessie Rayburn, psychic investigator for a firm called Haven, has been estranged from Emma for years. Unresolved issues from Jessie’s past have not only kept them apart but have been clouding Jessie’s unique abilities. A return to her hometown to face a dark and violent incident from years gone by is her chance to regain them. But reconciliation with the past comes with a price. Few people in Baron Hollow are welcoming Jessie back. No one dares to breathe a word. And in this conspiracy of silence, Emma’s nightmares are becoming more vivid than ever. I discovered Kay Hooper purely by coincidence a couple of years ago, and I promptly devoured her backlist. But then, she switched publishers and moved to hardcover, so I decided to wait until this book was out in mass market. And after reading it, I have a bit of mixed feelings. It was interesting to explore Baron Hollow from Jessie’s POV and see how it had changed from the last time she was home. I liked how not all of the changes were good changes. It was interesting to follow Emma and Jessie as they tried to build a relationship. What I also liked was that it didn’t happen over night. I liked Jessie’s motivation for returning sense, which made sense. But… sometimes I wished Jessie wasn’t so secretive. That she dared to open up, to talk to Emma. Emma had her own issues that she struggled with, both the fact that they existed, and that she wasn’t sure if she should tell Jessie or not. Nathan was an outsider, and had his own reasons for being in Baron Hollow. I liked him. He felt… grounded in away that Emma needed. The plot was well crafted, and I really liked how the different plot threads were connected. From Jessie’s poking around, to Emma’s secret and Nathan’s blood hound gift. All of them contained a part of the solution. The romance between Nathan and Emma was sweet, even if it wasn’t without issues. That said, I had one big problem with this book. It didn’t feel like a Romantic Suspense novel. It felt more like Mystery novel, with some paranormal elements tossed in. Maybe a big reason for that was that it felt like Ms Hooper had picked several plot elements from her previous novels and reused them. And, to be frank, those previous books were much better.